Customers usually tend to create same ticket many times. WP Ticket helps you to associate these tickets with each other and help your agents increase productivity. Duplicate is used for tickets whose content is the same as the connected ticket(s). Once a ticket is related to another ticket, "Related Tickets" tab is displayed on the ticket page. 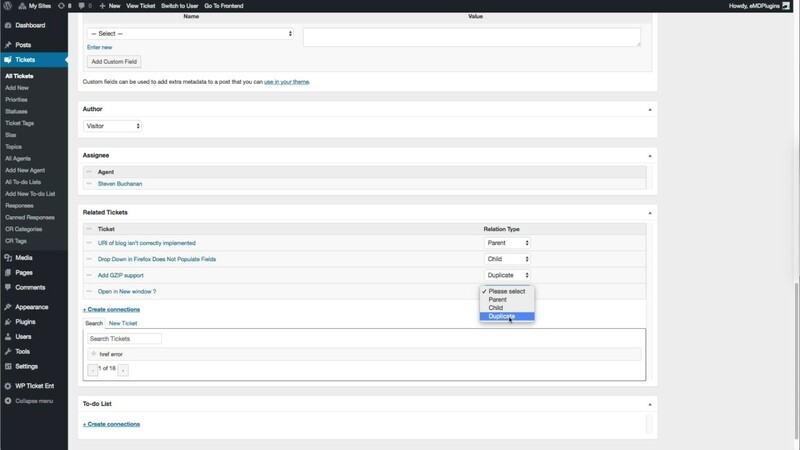 Customers and support team can export, sort, and search related tickets on the frontend and WordPress Dashboard. I purchased the Enterprise version of WP Ticket to support incoming email from clients (apparently also available as extension to free version), as my previous ticket plugin was no longer supporting incoming email communications on our WPEngine host. The WP Ticket developer diagnosed the problem (which several hours with WPEngine support techs had failed to do), and fixed it immediately in a revised version. I’m very happy with their level of support, and the plugin itself appears well thought out with good customization/extensibility. Very simple and easy to use support ticket plug in. I needed some help due to some issues with an upgrade and support responded immediately and helped me solve the issue. Highly recommended if you are looking for a wordpress dashboard support system. The plugin covers all the bases. Easy to use and great tool for support service. A 5% increase in customer retention increases profits up to 95%. Get started Now! Sign up to get WP Ticket news and updates.